Metal gods Judas Priest have been putting out albums since 1974, and their legacy is untouchable. At this stage in their careers and lives, there would be no shame at all in playing the nostalgia angle – albums in their entirety, etc. But that’s not in their genes, and despite the fact that the band’s output has been shaky at best since 1990’s Painkiller, they continue to record new music, even though some band members are now in their sixties and seventies. 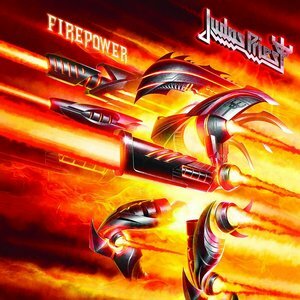 Firepower is Judas Priest’s 18th studio album, and follows on 2014’s uneven Redeemer of Souls. For me, the bar has been set low over recent years, and my hopes were that best case scenario the band wouldn’t embarrass themselves. Consider my hopes to have been exceeded. “Firepower” is the opening track, and it attacks with more ferocity than anything since “Painkiller.” It’s fast and furious, with razor blade guitars and pummeling double-bass drum work. It’s as vital as the band have sounded in ages for sure, and they don’t take their feet off the gas. “Lightning Strike” and “Evil Never Dies” are both heavy numbers, the former another up-tempo track and the latter featuring a killer chorus. Through all the songs, 66 year old Rob Halford’s voice continues to defy age, with low register menace and upper register screams sounding as potent as ever. Add in the usual excellent lead breaks from old-timer Glenn Tipton and relative newcomer Richie Faulkner (a member since 2011), some heavy riffing, and the rock-solid rhythm section of Ian Hill on bass and Scott Travis behind the kit, and we’ve got a band firing on all cylinders throughout Firepower. It’s remarkable, really. Listening to Firepower over and over, one word that comes to mind is consistency. While no songs immediately grab the listener like “Freewheel Burning” or “The Hellion/Electric Eye,” there are no duds here, which is the first time we’ve been able to say that since Painkiller. One has to assume the production duo of Andy Sneap and Tom Allom have something to do with this. Sneap brings a modern sensibility to the affair, while Allom was the man responsible for all of the band’s output from Unleashed In The East to Ram It Down, their most popular years, and knows how to coax the most out of the band. That being said, a number of songs are borderline gems. “Evil Never Dies” could fit in with the Painkiller songs, while “Rising From Ruins” is a top-notch anthem, a modern-sounding cut with its base firmly rooted in the Stained Class era. “No Surrender” would have been one of the best songs on Point of Entry, and it’s the closest we get to a bona fide fist-pumping arena anthem. A couple listens in and I was chanting along to the chorus with plenty of enthusiasm. And “Traitors Gate” is an excellent track about the Tower of London, full of mood and again nodding back respectfully to the band’s ’70s era while sonically planted in 2018. It’s a common theme, drawing in elements of past glory but with a modern sheen atop, and thanks to the deftness of Sneap and Allom the tactic never fails to impress. Firepower is still too long, as all modern Priest albums seem to be. The 14 songs could have been culled to 10 or 11 and we’d have a burner on our hands. As it is, Judas Priest have still managed to deliver an electric, vital album that surpasses anything they’ve released in nearly 30 years. Firepower is the band’s best record since Painkiller.